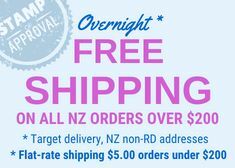 Orders in NZ can be sent anywhere in NZ - street address, work address, RD address, PO Box. WHAT IS THE TARGET FOR DELIVERY BY COURIER POST? In a nutshell...the target is overnight (Mon-Fri) to town addresses, and to rural addresses 2-3 days more. Our personal target is to dispatch orders (if they've been placed and paid for before the daily cut-off of 2pm Monday-Friday) on the day you place the order. Courier Post's target time-frame for delivery is 9am next working day (Monday to Friday) for business addresses and 5pm next working day (Monday to Friday) for residential addresses (but it's often sooner in the day). Please be aware that this is a TARGET, not a hard-and fast rule. Processing issues at Courier Post, transport delays, road issues, etc, can all play a part in the length of delivery, and for this reason Courier Post do not guarantee the Overnight-ness of your delivery. We send tracking details by email, for your order once it is dispatched. NB; There is no same-day or same-day evening service running out from New Plymouth which is where we are based. Courier Post standards for urban deliveries is to attempt delivery by first knocking at an accessible door on the property, then if no answer, the driver is to leave the parcel where they deem it to be safe, and if this is not possible they are to leave a card to call. Sure! Feel free to add any special instructions such as "leave by the front door", "leave in the letterbox" or "leave on the deck chair on the back patio under the blue cushion and turn the deck chair away from the door after doing so". Type these in your address details at Checkout. For items leaving here on Friday you can choose Saturday Delivery at checkout. This service is a target time-frame and like any delivery, can't be guaranteed. The target for delivery is 1pm for all addresses with a Saturday Delivery sticker on them. Saturday delivery is NOT available to RD addresses or PO Boxes. Occasionally, due to bad weather conditions or unforseen delays in delivery, items may arrive to you later than expected. Please read our terms and conditions.